EUROPA - European Union website - EUROPA is the official EU website that provides access to information published by all EU institutions, agencies and bodies.EUROPA - European Union website, the official EU website. Where are Europa.eu website's visitors located? From the map below, you will know that most of the visitors to this site are from Italy, there are about 15,282 visitors per day. Which subdomains visitors often go on Europa.eu? From the chart below, you will know that the subdomain ec.europa.eu is very popular, there are about 86,100 visitors per day. Which search keywords send traffic to Europa.eu website? From the chart below, you will know that there are a lot of visitors to this site by searching the keyword "eba", about 417 visitors per day. 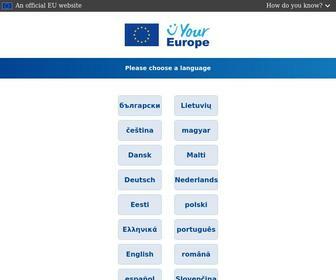 Where is Europa.eu website's server located? This site has 2 servers, one of the servers is located in Luxembourg. Here we know the reputation of Europa.eu through several ways. From the chart below, we know that the safety status of the site is safe. From Nov 16, 2011 till now, we detected 46 times on Europa.eu website. we found that the average Google pagerank is 9. Recently the site was detected on Mar 13, 2016, the Google pagerank is 9. From Oct 13, 2011 till now, we detected 34 times on Europa.eu website. we found that when you open the site would take an average of about 0.981 seconds to load completely. Recently the site was detected on Jun 26, 2017, it took 1.23 seconds. From Oct 13, 2011 till now, we detected 28 times on Europa.eu website. we found that this site has an average of 272,443 backlinks. Recently the site was detected on Jun 26, 2017, there are about 197,463 backlinks were found. What websites link to Europa.eu? The websites below are linking to Europa.eu. What websites are owned by the same person who owns that Europa.eu website? The websites below are owned by the same owner or not. What websites are similar to Europa.eu website? The websites below are similar to it. This is the domain name information about Europa.eu. With this information, you will know that it was registered on the website proximus.be, etc.